This is one of the coolest little lockbacks I’ve seen. As many know, I don’t normally collect traditional lock-backs, but the look and feel of this one really impresses me. I really like the way it looks. The blade can be pinched open with practice. The handle shape is similar to a finger grooved hunter. Despite the petite size the finger grooves allows for a sure grip of this small framed knife. The blade lock is very positive and the razor sharp drop point style blade allows for easy precise cutting. This knife is one of my favorites. While too small to be used for skinning or gutting, it is handy for many cutting chores and small enough to carry every day. Despite the small frame the blade is significantly wider than a blade on a peanut or tiny toothpick. As such it is less prone to breaking; plus it locks in place! Bone looks great, and the blade closes with a great snap, especially for a knife this small. 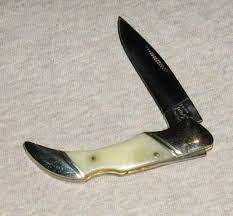 In the white smooth bone, the knife makes for nice little gentleman’s lockback. And yes I have carried and used htis knife on several occasions.Rough Rider hit it out of the park with this one. Fit and finish is terrific. It really is too good to be locked up just for looks. I’m have plans to not only this knife in other handle materials but also duplicates of the white smooth bone handle. It is just that good. Other knives in this pattern: RR 138 - Orange Smooth bone, RR083 - Amber Jigged, RR276 – Red Jigged. Here is hoping it comes out in other versions in the near future. When opened, the Diablo looks like a baby Deer Slayer. While it is very small, it is easy to grip and can handle many day to day cutting chores.